I literally found this book at an airport by a most gripping cover. I added it to my Goodread's shelf and boarded my plane. In December, it was on sale at B&N for 99c. I remembered it immediately both for the cover and how much I have been intrigued I was to read it. When I thought about a book to do for this series, this jumped at me. Let's begin. So we meet Henry James, and infer that he is drunk. Well, he tells us so in the first sentence. He's eating dinner with Oscar Wilde and other people who I think I am suppose to know, but may not be cultured enough to. In a way I am fitting in with drunk James, who can't reliably tell me anyone's name at the table until it comes up in dialog. Literally. So we have a lot of "the female to his left"; "the elderly gentleman"; "the American women"; and let's not forget "the pretty, impressionable woman". I have no idea who anyone is and I am starting to think James may be an unreliable narrator. Anyway, I do know what they are talking about. After getting in a few jibes at Jekyll and Hyde and Stevenson, the table conversation turns to Jack the Ripper. So this whole chapter we learn 1)Jack the Ripper is killing poor women 2)what Henry James has for dinner. Wow, we literally went from falling asleep at a table over food, to stumbling about and worrying about puking or pooing himself. I am not kidding. Did Henry James suffer from IBS or is this artistic license? I don't even know what to think. He gets lost in the slums, heaves the contents of his stomach on a prostitute, falls to the ground puking while someone tries to rob him and then is mysteriously saved by someone. End chapter two. Chapter three is two pages. 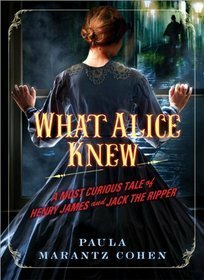 It's a letter from the police in London asking William James, Henry and Alice's brother, to come over to England from America to help solve the mystery of Jack the Ripper. William James is a professor, whom according to the letter, "engaged in important research in the new science of the mind." Apparently this qualifies him to help with the case. In chapter 4 (page 26 if you all are wondering), we finally meat our titular character, Alice. Apparently Alice is a "professional invalid." She has a whole list of maladies that she decides makes more sense to stay in bed rather then be walking around when one strikes. All three siblings are together here chatting. First topic of conversation is Alice's invalid-ness. William thinks he can cure her, and Alice wants none of it. Same with marriage apparently. They move on to why William came to London and he shows them the letter. Alice decides that this is finally a step in the right direction because between the three of them they can solve it. "It occurred to me, as I read William's letter, that the solution to these horrific crimes requires the three of us. 'Tri-ocular vision,' I would call it." She paused, as if working out an equation. "Henry, to observe the social world where I sense the murderer lurks and to plumb his friends and acquaintances for gossip. William, to study the physical evidence through his contact with the police and to supply psychological analysis where needed." "And you?" William asked in amused wonder. "What will you do?" "Me?" She leveled her intelligent gaze at her brothers. "I will review what you gather... and solve the case"
I am not going to lie. This wasn't what I expected. Maybe it's the disjointed narration thus far, and the unlikability of Henry those first two chapters. However, I am still really intrigued on where this is going. Maybe now that all three characters have been established and a goal set, the narrative will smooth out a bit and catch some steam. I feel like I'm in a dream with people I may have vaguely heard once mentioned in English class and expected to produce wit. Oh no! Maybe I am "American Woman"!! I think the first two chapters, instead of enrapturing me into the world, just made me raise my eyebrow. The scene with the siblings, however, gives me some hope that this is where the story would be going and not staying with Henry, drunk at a table, unable to identify people and throwing up on prostitutes. Like I said I am still rather intrigued. I will keep going and hopefully get caught up in the mystery that is Jack the Ripper and the interactions between these rather non-traditional siblings. PS: After I started this book, I made a quick jump to the ever resourceful Wikipedia to read up on the James clan and all those people who I thought may be famous literary people. Some of them are, apparently. And yes, Shaw was alive at this time (I thought he was more of an early 1990s guy. But I guess the late 1800s isnt too far away from early 1900s). I did find out more about the siblings, but I think I would have been happier not knowing, so then I can live in ignorance of any artistic license. Will this hinder my enjoyment? Probably not. I guess it's good to know, though. I like this idea, it's really peculiar, and now I'm curious about the book. This sounds interesting! Will be interested in seeing your final assessment of the book! This books sounds interesting, but so far, a bit of a mess. Your reactions were hilarious ("Oh no! Maybe I am "American Woman"!). I hope the book finds its rhythm soon and that it turns around for you. Ha! No worries. There have been six J-ladies since the site started to review here. Confusion is understandable. I literally wrote this real time when I read it. I am glad you like my inner dialogue! I am hoping it pulls together soon! Oooo! I like this View from Page Thirty. It is such a unique idea. And I am loving the sound of this book. It is so different.